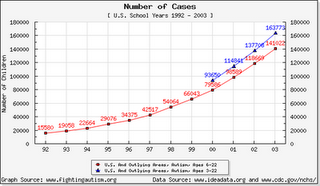 I have argued many times that there hasn't been a real epidemic of autism. The evidence is compelling. For example, we know how much the proportion of autistic CDDS clients with mental retardation has changed since 1992 to the present time. We know that the rate of institutionalization of developmentally disabled individuals is not on an upward trend. And there is evidence of diagnostic substitution. But we are still left with the question as to why the number of diagnoses has increased so much. Sure, we talk about an increase in awareness and changes in criteria and cultural perceptions. But why did this happen mostly in the 1990s? Lorna Wing coined the term Asperger's syndrome in 1981. The DSM-IV was published in 1994, years after the increasing trend in diagnosed cases had started. The trend accelerated after the DSM-IV publication, but there's no noticeable spike. I think there has to be an independent cultural phenomenon that drove changes in awareness and cultural perceptions. I think the key to answering this question comes from parent experiences regarding how a child's diagnosis of autism came about. Usually it goes like this. The pediatrician tells the parents not to worry or gives an assessment completely unrelated to autism. The parents start to do their own research. Then they go to a hospital or find an specialist who is able to diagnose autism. My guess is that when parents visit a psychiatrist they typically already suspect the diagnosis of autism. It is not far fetched to suppose that the internet has made a huge difference in providing parents the ability to carry out extensive research, and enhancing general awareness. The internet began to take off shortly before the 1990s. At that time there was Usenet. There were mailing lists. It was more of an academic tool rather than a corporate one. Gopher was released in 1991 and begun to gain in popularity. 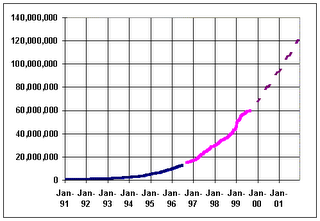 By Q2 1994, the world wide web surpassed Gopher and that's when the internet really exploded. Regions with higher internet penetration will tend to have a higher incidence of autism. (This would explain in part the link to degree of urbanization, with another factor being availability of specialists). In populations with no internet access whatsoever, autism will be virtually unheard of. At time of diagnosis, households with an autistic child are more likely to have internet service than households of a control group matched by age, even after social class is considered. Internet access correlates with reduced elapsed time from concern to diagnosis. I just found this study in PubMed and I was surprised that no one has commented yet. Maybe it just appeared there. I think this could be pretty controversial. Breastfeeding, Infant Formula Supplementation, and Autistic Disorder: the Results of a Parent Survey. Schultz ST, Klonoff-Cohen HS, Wingard DL, Akshoomoff NA, Macera CA, Ji M, Bacher C.
ABSTRACT: BACKGROUND: Although autistic disorder is associated with several congenital conditions, the cause for most cases is unknown. The present study was undertaken to determine whether breastfeeding or the use of infant formula supplemented with docosahexaenoic acid and arachidonic acid is associated with autistic disorder. The hypothesis is that breastfeeding and use of infant formula supplemented with docosahexaenoic acid/arachidonic acid are protective for autistic disorder. METHODS: This is a case-control study using data from the Autism Internet Research Survey, an online parental survey conducted from February to April 2005 with results for 861 children with autistic disorder and 123 control children. The analyses were performed using logistic regression. RESULTS: Absence of breastfeeding when compared to breastfeeding for more than six months was significantly associated with an increase in the odds of having autistic disorder when all cases were considered (OR 2.48, 95% CI 1.42, 4.35) and after limiting cases to children with regression in development (OR 1.95, 95% CI 1.01, 3.78). Use of infant formula without docosahexaenoic acid and arachidonic acid supplementation versus exclusive breastfeeding was associated with a significant increase in the odds of autistic disorder when all cases were considered (OR 4.41, 95% CI 1.24, 15.7) and after limiting cases to children with regression in development (OR 12.96, 95% CI 1.27, 132). CONCLUSIONS: The results of this preliminary study indicate that children who were not breastfed or were fed infant formula without docosahexaenoic acid/arachidonic acid supplementation were significantly more likely to have autistic disorder. The methodology looks OK. For anyone interested in environmental factors in autism, there you go. Nutrition and brain development appear to be related (no kidding). It even looks like there's a stronger correlation of lack of EFA supplementation to regressive autism. This puts a recent double-blind study of EFAs in perspective. So for anyone interested in "biomed" interventions, there you go. There are prior studies on lactation supplementation and neurological outcomes in the general population. See, for example, Birch et al. (1999) and Helland et al. (2003). I would not say that reduced EFA supplementation causes autism, but it probably makes a diagnosis more likely. The autism twin study considered the best methodologically speaking found a MZ twin concordance of 60% for autistic disorder and 92% for a broad spectrum. The DZ twin concordances were 0% and 10% respectively. Given that MZ twin concordance is not 100%, people correctly assume that environmental factors must be involved in the etiology of autism. But some go further than that and speculate that the environmental factors must surely be environmental "insults", and that they probably occur post-natally. This would probably be true if there was no random variation in brain development, and no phenotypical variability due to the social environment. No human phenotype is 100% heritable. Only very simple physical phenotypes, such as eye color, approach that level of concordance. Let's take White et al. (2002). This study compared the brains of general population MZ twins and found a concordance of over 0.90 for white and grey matter volumes, but only 0.75 for the thalamus, to take one example. Syndromes known to be genetic in nature can have discordant expression. Kruyer et al. (1994) reports on two sets of MZ twins discordant for Fragile-X. In one pair of sisters, one has mental retardation and the other does not. In each of the pairs the researchers explained the discordance genetically. A Google Scholar search on discordant MZ twins reveals many other such reports. MZ twins can be discordant for homosexuality. But there is no significant effort to try to pin down the environmental factors involved there. (Hint: It's not likely the vaccines). Concordance of intelligence is not 100%. It seems to be about 80% for MZ twins reared together, and slightly lower for MZ twins reared apart. Phenotypical variation for intelligence is probably determined by the neurological variability discussed above, plus life experience. The social environment should not be discounted altogether, as much as people would prefer to. A case in point is that of congenitally blind children, who tend to become autistic. For those who believe ABA (or some other treatment) works, here's something to ponder. Imagine a pair of autistic MZ twins, one given to a family that believes in ABA and the other given to a family which does not. Can the subsequent discordance be blamed on the one set of parents? Note that I'm not saying that autistic children are never subject to environmental insult, or that environmental insult does not result in autism-related phenotypical variability. I am simply saying that environmental insult is not necessary to explain MZ twin discordance, as is often argued. It's no secret that many proponents of now discredited hypotheses are quietly pursuing new causation theories without explicitly admitting so. But more than pursing new causation theories in an effort to improve our understanding of autism, they seem intent in continuing to look exclusively for "something wicked." Dan Olmstead, a journalist of "no autism among the Amish" fame, is a case in point, with his three new Age of Autism articles titled Something Wicked -- 1, Something Wicked -- 2 and About Those "Old Dads". In them he puts forth the hypothesis that autism may be caused by chemicals parents are exposed to. The mechanism or its plausibility are not clear, but let's leave that aside for the time being. We've also pointed out a possible connection in the very first cases described in the medical literature -- 11 children born in the 1930s -- with new chemical compounds, plausibly including mercury-based fungicides. One of those 11 kids was the son of a plant pathologist, another the son of a forestry professor at a southern university, and a third grew up in an area being heavily planted with seedlings to create a national forest in Mississippi (there's that southern forestry connection again -- in fact, his home town is named Forest). A fourth was the son of a mining engineer. And the very first case to come to medical attention, at Johns Hopkins University in 1935, was the son of a 30-year-old chemist-attorney at the U.S. Patent Office. A chemist. Anyone with more than a passing interest in autism research will recognize the obvious confound in this hypothesis. I would also point out that these studies are from a different generation, and we might find things have changed. For example, I would wager computing might be a relatively common occupation among parents of autistic children nowadays. (Readers are encouraged to provide anecdotal data in the comments section). A series of articles (e.g. Baron-Cohen et al. (1998)) have shown that mathematicians, computer scientists, physicists and engineers are over-represented among the parents of autistic children. Jarrold & Routh (1998) analyzed the data and found that the parents of autistic children were also over-represented in accountancy and science, suggesting that perhaps there's a general professional over-representation. Wheelwright & Baron-Cohen (2001) argued that even taking into account a possible over-representation of professionals, engineers were still over-represented. Further evidence of this confound comes from an AQ test assessment by Baron-Cohen et al. (2004). The researchers found that "scientists (including mathematicians) scored significantly higher than both humanities and social sciences students" and that "within the sciences, mathematicians scored highest." Further, the group of Mathematics Olympiad winners scored significantly higher than the male Cambridge Humanities students. Dan Olmstead does try to address the confound by pointing out that there is no correlation between social class and autism, which is correct. But social class is clearly not what the confound is about. Blaxill's graph was also shown in Figure 1 of Stehr-Green et al. (2003). Stehr-Green et al. 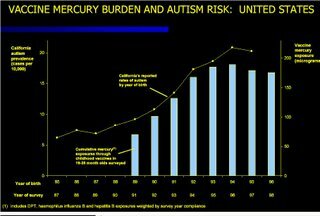 conclude that there is no consistent relationship between thimerosal and autism, however. The graph also has some similarities to Figure 2 of Geier & Geier (2004) which I already critiqued. The drop in prevalence and thimerosal exposure starts one year earlier in the Geiers' paper. The thimerosal dose per child in the graph is probably correct. The main problem with the graph is that it shows a prevalence drop in the 1995 birth year cohort. This drop is likely due to left-censorship. In other words, children in recent birth-year cohorts are too young to be diagnosed. Graphs by birth year cohort are not fixed. They change as they are revised from one year to the next. The prevalence of autism did not really drop for people born in 1995 and 1996. So the correlation shown there is either a coincidence or you would have to wait for the right year to make the graph. In fact, a 2005 SafeMinds document by Redwood and Blaxill has a graph (second one down) which clearly shows the prevalence by birth year cohort did not drop in 1995, 1996 or 1997. The graph from Blaxill's 2001 presentation says children were surveyed 2 years after their birth year. But this simply cannot be right. If you look at the 2005 SafeMinds document, it is clear that prevalence in a birth year cohort stabilizes at about age 8 and it's about half its peak at age 3. The 2001 graph is close to the 2005 graph, except for the 1995 birth year prevalence. The 2001 graph appears to simply show prevalence by birth year cohort, as surveyed around the year 2000. Another problem with the graph is that it doesn't show thimerosal exposure before 1989. 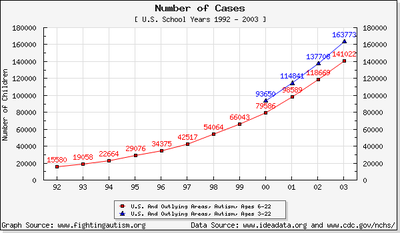 If it did, it would likely show a flat bar graph before that year, concurrent with an increasing autism prevalence trend. In other words, graphing thimerosal dose per child before 1989 would tend not to support the desired correlation. Geier & Geier (2004) avoids that problem by simply skipping the 1986-1989 range altogether in their graph. Methodological problems aside, Mark Blaxill is known as a reasonable and knowledgeable individual. He clearly knows about thimerosal dosage and about autism prevalence. He must realize that birth cohorts after 2000 could not have received more than 25 micrograms of thimerosal – less than 1/3rd of what he shows for 1989. He must also realize autism prevalence is not dropping in the youngest age cohorts data is available for. As Mark Blaxill is respected by proponents of the thimerosal hypothesis, isn't he the most indicated person to put this hypothesis to rest? I think history is calling upon Mark Blaxill to do the right thing. Why is he so quiet about this nowadays? Some pretty interesting events seem to be unfolding at EOHarm these days. But in this short post I just want to address two statements I found Mark Blaxill has made there, and I would like to invite him to debate the first one. If Mark Blaxill believes that ASD is rare in adults, I hope he can address Stahlberg et al (2004), Shah et al (1982), Baron-Cohen et al (2001) and Wakabayashi et al (2004). Or perhaps Mr. Blaxill just means "diagnosed" ASD, in which case he might be right, but that would mean he has given up his "hidden horde" device. If he meant "autistic disorder" and not ASD as he stated, that's a little bit harder to judge given available data, but his numbers would also be wrong. Here I just want to point out that Autism Hub readers can also go to Amazon, look for any book (e.g. "Evidence Of Harm"), rate the reviews, and add your own review – if you have read the book of course.